The armed militants of the so-called Donetsk People’s Republic (DPR) threated the OSCE SMM observers with AK-47 and did not allow them to launch the drone near Kremenets, Donetsk region uncontrolled by Ukraine on April 5 as the mission reported. The patrol of the mission consisted of six observers on two armored vehicles was at H15 road in two kilometers from the checkpoint of the armed formations of the militants. The observers prepared for the planned launch of the medium range drone. Before they finished the preparations, blue Lada (with table AA237 and marks ‘police’ in the Russian language) turned toward the observers. Three men went out the car: one in the camouflage and two in some kind of the police uniform. Each of them had AK-47 rifles. One of them came to the SMM patrol and introduced himself as ‘commander of special forces’. He claimed that ‘it is a no-fly zone’ and they were not reported on the launch of the drone by the mission. Later one more car with two armed men in camouflage drove to the SMM. The driver was armed with an AK-47 rifle. They got out from the car and aggressively appealed to the members of the mission’s patrol. The SMM workers heard that one of them said to another in Russian ‘Get ready!’. Then the second man placed the bullet in the chamber and pointed the gun to the ground with his finger on the trigger. SMM gathered the equipment and left this region. The SMM informed the armed formation in Donetsk about this incident. 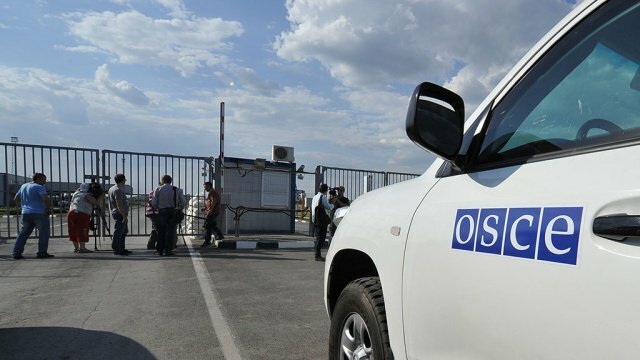 As we reported the OSCE extended the mandate of the Special Monitoring Mission in Donbas until March 31, 2019. On March 5 at 12:55, when an OSCE Special Monitoring Mission patrol consisting of six members and two armoured vehicles was heading from west to east on a road in Kozatske, it saw a man in military-type attire armed with an assault rifle (AK-74) standing at a checkpoint of the armed formations on the eastern edge of the village. The SMM also saw him pointing the assault rifle directly at the first SMM vehicle, which was then about 120m west of the checkpoint.